This first decan of the constellation Scorpio introduces the most ancient symbol of wickedness — the serpent. You are probably familiar with the first instance of the mention of Satan in the Bible. It is found in the account in Genesis of Adam and Eve’s fall into sin when Satan comes to Eve in the form of a serpent who was called the most “subtle” of all the creatures. It is important to study Serpens (the serpent) right along with Ophiuchus (the next decan) because the two are struggling together. As we study these two pictures together their message becomes immediately clear. The powerful serpent is engaged in an intense struggle with an even more powerful man. This glorious Wrestler (Ophiucus) is mastering that ancient enemy, foiling his plans to seize the crown (CORONA) that belongs rightfully, and only, to God’s Son, who is none other than the great Wrestler himself! The Greek mythology associated with this sign is very interesting! The wrestler is Ophiucus is Apollo’s son. He is struggling with the serpent for a crown that rightfully belongs to another. 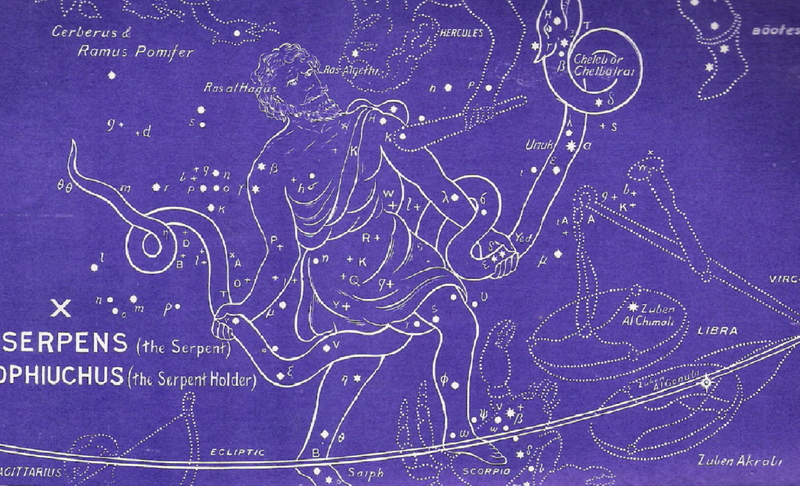 In the picture, Serpens (the serpent) is struggling with Ophiucus for the crown (Corona) which is above the head of Serpens (out of this picture — see the full star chart on our Star Chart page for a better picture). The figure suggests the intensity of this conflict. The man’s extreme energies are directed at the beast who appears to respond in kind. We see here most clearly the conflict of the ages which pits the gracious plan of God against the destructive plans of Satan. Yet there is no doubt as to the outcome. We have already seen that in Scorpio. Satan is already defeated — his head is bruised unto death. But we also see here the daily struggle of the condemned one (Satan) who has not yet received the penalty of his condemnation. He is continuing to struggle — and will do so until the second coming of the Lord Jesus — to possess the crown. He will struggle for dominion. But Christ’s dominion was secured for Him at the cross. To continue in the correct order of the ancient star chart, please select the Ophiucus menu option next. Or click on The Big Picture menu option to the left for more information about the Gospel in the stars.